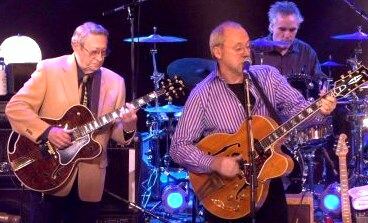 'A Tribute To The King' - by Scotty Moore & Friends. ‘Scotty Moore was in the delivery room when Rock & Roll was born, kicking and howling in the Tennessee night. 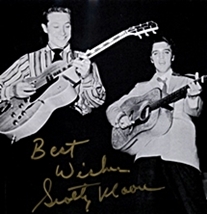 June 28, 2016 - Scotty Moore - Guitar Legend, Has Died: EIN has just been informed that the guitar legend Scotty Moore passed away a few hours ago. He was 84. Trevor Cajiao (of ETM&HM) has verified this truly sad news. Scotty Moore was in the delivery room when Rock & Roll was born, kicking and howling in the Tennessee night. 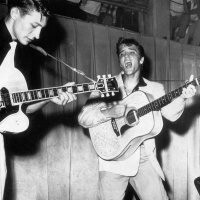 Without the driving force and support of Scotty Moore, the start of Elvis Presley's career would have been very different. It is noteworthy that 'That's All Right' (Sun 209) was credited to "Elvis Presley, Scotty and Bill." 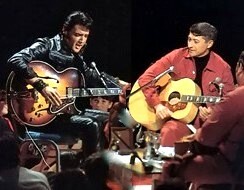 Scotty, Bill Black & D.J Fontana were Elvis' key musicians through to 1958 when Elvis went into the army. 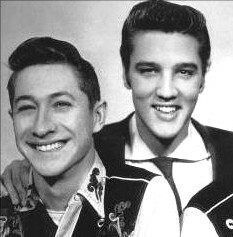 Scotty Moore would return for Elvis' all important 1960 recording sessions and would keep on working with Elvis until the 1968 Comeback show. Winfield Scott Moore III was born on December 27, 1931. He was a great great man, a guitar legend and a very fine gentleman. RIP. 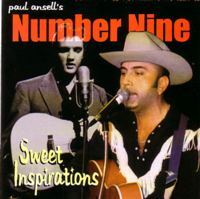 Paul Ansell (right) has his own band ‘Number Nine’ and is renowned for "Smokin, country, rockin blues" and it shows. He has an edge that makes you want to get up & dance while never over-powering the feel of Elvis or the playing of Scotty Moore. Hearing ‘A Mess Of Blues’ live & in this quality is a delicious treat. His cool-swing version of ‘Reconsider Baby’ where Scotty plays some devilish guitar licks is one of the real highlights. 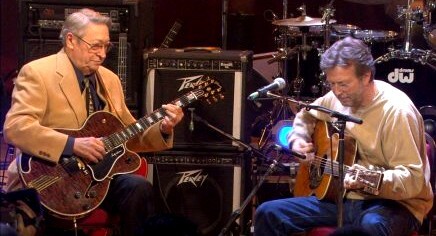 Scotty Moore & Eric Clapton Moore, "Guitar Gods", sharing thier love of Elvis.  Scotty once again reminds us that Chet Atkins plays rhythm guitar on the original ‘Heartbreak Hotel’. 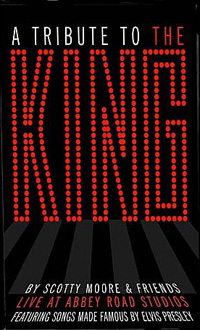 DVD review - 'A Tribute To The King' - by Scotty Moore & Friends. Ernst Jorgensen; The 2002 Definitive Interview with Arjan Deelen.